The Fenians are coming! The Fenians are coming! VANKLEEK HILL – Sometimes, it is just a matter of time. And on May 17, after a century and a half, the Fenians expected in 1866-67 will finally arrive in Vankleek Hill. And the soldiers at the Higginson Tower will be ready for them. The dreaded Fenian raid will take place at the Higginson Tower and if you are there at the right time, you will see the battle, thanks to four re-enactment groups that are coming to Vankleek Hill to re-create this moment in history. As if there already wasn’t lots to see and do in Vankleek Hill during the traditional May Show Festival weekend, on May 17 and 18, some heritage is being injected into the mix. Military re-enactors and members of the “1860s Living History” group, will be camped out near the Higginson Tower, re-creating life much as it was in the 1860s. To capture some of the exciting battle scenes or sketch some of the historical re-enactment moments, “plein air” sketching-painting-photography is welcome on-site that day, as Arbor Gallery Centre for Contemporary Art invites local artists to take advantage of the chance to take an artistic walk back in time. The 1800s Living History group, members of the Brockville Light Infranty Company, the 1860s Artillery Unit and the Civilians in the Midst of Alarums (CITMA) will be on-site during the weekend; events are being organized by the Friends of the Higginson Tower. Funds raised during the May 17-18 weekend are being matched by Vankleek Hill’s Scotiabank as part of the Team Scotia Community Program, which matches funds raised by eligible community groups to a maximum of $5,000. In keeping with the historical theme of this weekend at the tower, a special exhibit is in the works for Arbor Gallery – Centre for Contemporary Art for the six-week period around the Victoria Day weekend. The exhibit will focus on the history of the Higginson house (home of Arbor Gallery – Centre for Contemporary Art) and three members of the Higginson family: Lieutenant Colonel Thomas Higginson, his son, Lieutenant Colonel William Higginson and his cousin, Thomas Tweed Higginson and their involvement in the 18th Battalion of Prescott Milita. 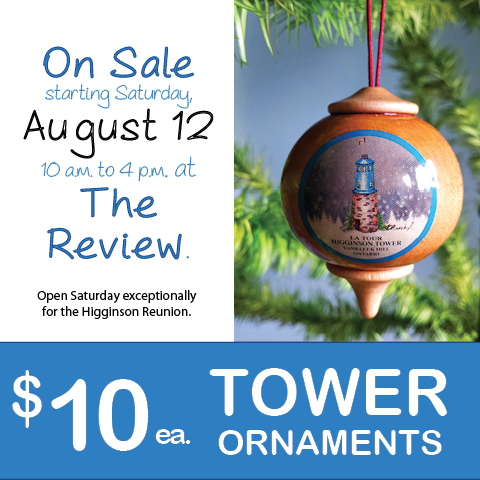 Higginson memorabilia, military items and the telescope, donated to the Higginson Tower Restoration Project by the late Thomas Higginson, will be on display as part of this exhibit. On Saturday, May 17, at 1:30 p.m., the Fenians will be thwarted by the Prescott Militia during a live action, role-play of a skirmish. The fight is expected to last about 15 to 20 minutes. Immediately afterwards, at about 2 p.m., children will be asked to help round up the Fenian invaders and take them prisoner to the tower. (Before the skirmish, there will be a 1 p.m. “School of the Soldier” for children. A complete schedule of activities related to the military and Living History re-enactors is available online on the Higginson Tower website (higginsontower.ca). On May 17, between 10 a.m. and 4 p.m., visitors will have the chance to have their photographs taken in historic costumes, which are being loaned to the Friends of the Higginson Tower for the day. A small fee will be charged to have your photograph taken; a digital photograph will be emailed to those who pose for pictures. On Sunday, May 18, a historical church service takes place at St. John’s Anglican Church. An old-fashioned worship service will include re-enactors in costume, old 1860s hymns and those attending are welcome to attend in period dress. During the afternoon, historical demonstrations will take place from 1 p.m. to 4 p.m., as well as a drill at the encampment and at the tower. The site closes at 5 p.m. Visitors to the Higginson Tower will have the opportunity to purchase cobblestones which can be added to the existing cobblestone walkway surrounding the tower and path. In 2005-2006, cobblestones were sold as part of the original fundraising campaign to restore the derelict tower. Cobblestones, which cost $150 each, go on sale on May 1 at Scotiabank in Vankleek Hill and will also be on sale at the tower on May 17 and 18. Higginson Tower history booklets (bilingual) will also be on sale at the tower on May 17 and 18, and donations will be accepted for ongoing support of the tower, which is operated by the incorporated, not-for-profit Higginson Tower Committee, which continues its work with the Friends of the Higginson Tower. The Higginson Tower Committee, formed in 2004, raised more than $300,000 in cash and in-kind donations from the community to restore the tower. Members of that committee are: Andre Martel, Louise Sproule, Gary Barton, Phil Arber, Yves Berthiaume and Gayle Renwick. The newly-formed Friends of the Higginson Tower includes: Jim Mullin, Eleanor Sides, Brien Mullin, Thelma MacCaskill and Ben Martin. Each year, the committee hires a student to work at the tower during the tourist season and pays for operating costs of the tower, which is owned by Champlain Township. The Fenians were an Irish Catholic Group that hoped to free Ireland by attacking the British colonies in North America. For years they had been preparing to do battle with the British Army in North America. The Fenians’ idea was to tie the enemy down, while brothers back home fought in Britain. When the American Civil War ended in April 1865, a group of former northern solders, mostly Irish Americans, formed small units intent on raiding Canada. Rumours reached New Brunswick that the Fenians intended to occupy Campobello Island, in the mouth of Passamaquoddy Bay. The invasion collapsed, but it instilled in Maritimers the fear of possible war. An election was called, and a pro-Confederation party was returned to power, partly on the threat of a Fenian invasion and partly through bribes to the electorate. The Fenians presented a more palpable threat in Upper Canada. On June 1, 1866, an estimated 1,500 Fenians crossed into Canada at the Niagara River at Buffalo. Two days later, the news that thousands of Fenians had crossed into Upper Canada reached Harris in church, and the militia left during the Litany. The volunteers clashed with the Fenians at Ridgeway and the volunteers were routed. Ten Canadians were killed and 38 wounded. On June 18, the volunteers all returned to their homes. The next spring, the Fenians threatened again. John A. Macdonald suspended the protection of habeas corpus for anyone suspected of being involved with them. But the Fenians remained a largely ineffective group. Their main gift was instilling fear. Although the Fenians failed to mount a decisive military action, they became a compelling symbol for the need for Confederation.